01.30.14 Sixty-two players turned out on January 20th to play in the 15th Annual MLK Day Tournament hosted by the Stillwater Montessori School in Old Town. The tournament featured four section: Open, K-12, K-8 and K-6 non-rated. Here's the illustrated tournament report with USCF crosstables. 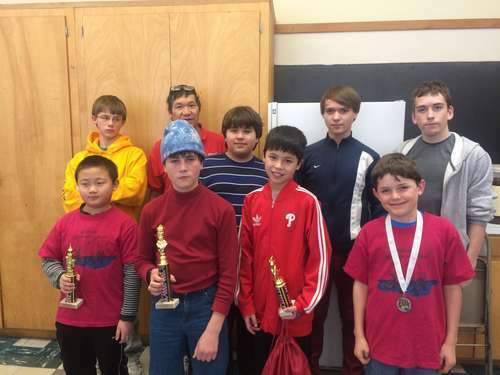 Winners in the K-6 non-rated section pose with Tournament Director Steve Wong at the 15th Annual MLK Day Chess Tournament hosted by the Stillwater Montessori School in Old Town on January 20th, 2014. Thanks to Joe Alex for contributing to this report. Max Berube and Chester Young shared first place in the Open section with 3.5 points in four games. They drew their individual encounter in the final round. Roger Morin took clear third with 3.0 points. Bill Burtt took fourth with 2.5 points followed by five players posting 2.0 points. In the K-12 section, Joseph Powell continued his winning ways with a perfect score of 4.0 points. He was trailed by Greg Wadsworth and Austin Burtt each scoring 3.0 points. Evan Viera took fourth and Grany Bodine, Nick Siebert and Jesse Amar rounded out the section. Ben Amar topped the twenty-eight player K-8 section with 4.0 points in four games. William Xu placed in clear second with 3.5 points and Nathan Shemwell, Zachary Grindal, Forrest T. Blankenship and Nicholas Kawamura tied for third with 3.0 points. Liam Farrell took the top 5th grade and under trophy. In the K-6 non-rated section, Cole Stewart finished first, Ross Stewart, Ben Freudig and Kai Diel all tied for second and Sam Parrott took fifth. The top 3rd grade and under award went to Finn Morfeld. 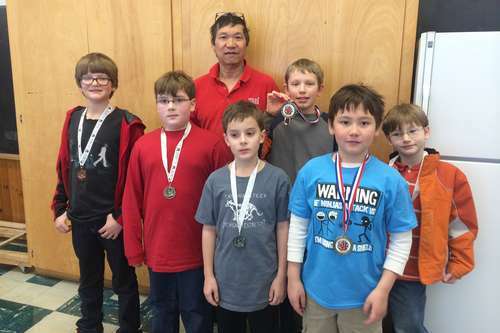 Winners in the K-8 section with TD Steve Wong. Winners in the K-12 section with the TD. Players battle for position in the K-8 section--the tournament's largest section. Action in the K-6 non-rated section. The eventual winner of the K-6 non-rated section, Cole Stewart (left), doesn't seem overly concerned about his position. Every World Champion was once a beginner! Players in the K-8 section. Another look at the K-12 section. Some of the bling players were competing for. Thanks to the hard work and dedication of tournament directors Andy Bryan (seated) and Steve Wong the tournament ran smoothly. Thanks to all who participated.